Each day, over 2000 aircraft travel across the Atlantic ocean bound for North America or Europe on the North Atlantic Organized Track System. Have you ever wondered how pilots navigate and communicate during the journey? Communication over the Atlantic is an interesting combination of modern digital messaging, satellite communication, and early 1900’s low-tech! (Not to be confused with the AeroSavvy Barista). This article has been written to give the reader a general idea of the procedures used on a trans-Atlantic flight. Actual procedures, messages, and radio contacts will vary based on aircraft equipment, airline, and the route flown. For heaven’s sake, don’t try flying an airplane over the Atlantic using this as your guide! To see how it all works, we’ll ride along with AeroSavvy Airlines flight 105 from New York, JFK to London, Heathrow. AeroSavvy 105 will depart JFK around 7:00PM EST. The flight is one of several hundred aircraft leaving North America, all heading the same direction across the Atlantic. Before we can fly across the Atlantic, we need to select a track (or route). Every day, from 0100z – 0800z (8 pm – 3 am EST) hundreds of airliners fly eastbound from North America to Europe. From 1130z – 1900z all that traffic flies back to North America. Why those times? Because that’s when most passengers want to fly these routes. To accommodate the twice-daily stampede, air traffic planners in Gander, Newfoundland and Prestwick, Scotland create weather optimized routes across the Atlantic, called the North Atlantic Organized Track system (NATs). NATs are like a multi-lane, one-way highway in the sky. The tracks change each day to provide the most efficient routes for the airlines. A track NOTAM (Notice to Airmen), also called a “track message,” that defines each day’s tracks is published online. Airline dispatchers and pilots use the published tracks to plan the day’s flights. Each track is labeled by a letter to make it easy to reference on a flight plan. Westbound tracks are labeled A, B, C, D, etc. Eastbound track labels are at the end of the alphabet (W, X, Y, Z). Click on the track message image to see how it looks. The chart below can be used to help decode the information. North Atlantic organized tracks were first used in 1898 for commercial shipping! Daily publication of tracks for aircraft use began in 1965. Each airline requests a track that will give their flight the best fuel efficiency. 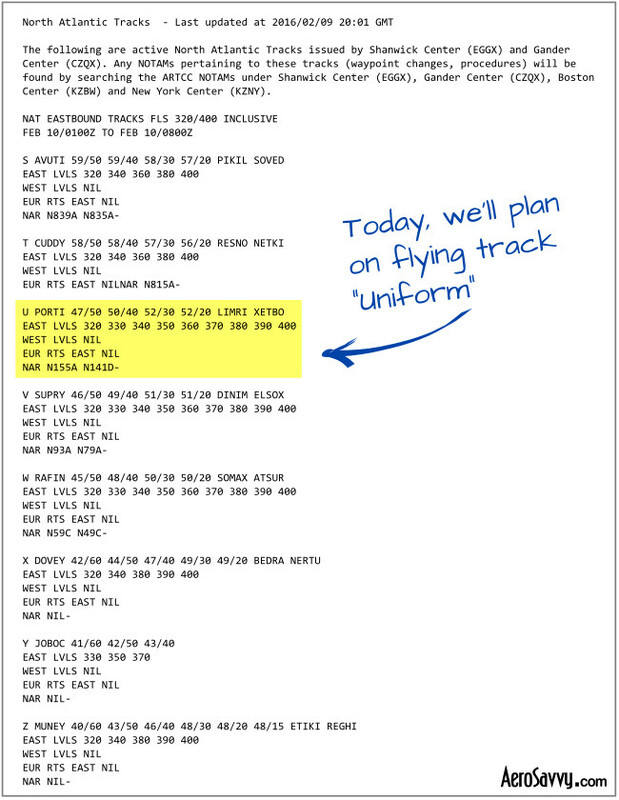 For our flight to London, AeroSavvy 105’s dispatcher requests track “Uniform” in our flight plan. Using the track message above, I highlighted and labeled the day’s tracks on a North Atlantic plotting chart. The next image shows our requested track Uniform by itself to better display the geography. The air traffic controllers in Gander, Newfoundland will assign us our actual track as we approach their airspace. Sometimes, due to traffic congestion, we’ll be assigned a different track than we requested. If that happens, we’ll reprogram our navigation system with the new route and be on our way. About 30 minutes before a flight departs, the crew contacts air traffic control to receive a route clearance. For most domestic and trans-Pacific flights, ATC issues the crew a complete route from start to finish. For Atlantic crossings, the route clearance covers the beginning and ending domestic portions of the flight. We won’t find out which track we are assigned until we are airborne and approaching the track system. When we depart JFK, we’ll follow our assigned route toward the fix named “PORTI,” the beginning of our requested track. The Flight Management Computer’s Control Display Unit (CDU) manages our digital communications. AeroSavvy 105 is off the ground and heading northeast toward Nova Scotia. About an hour after departure it’s time to start thinking about our oceanic clearance. A few years ago, all the clearances were issued by voice over the radio. Digital communications have made it much easier. We’ll get our oceanic clearance and track assignment by ACARS, a type of data and text messaging system. With a few button presses, we send the request about 90 minutes before reaching our oceanic entry point. It can take anywhere from a few minutes to an hour to receive an oceanic clearance from Gander. The controllers must take all the requests and make sure aircraft are appropriately spaced along the tracks. After a short wait, our cockpit chime rings and our oceanic clearance is ready to view. Today, we have been cleared across the Atlantic on Track Uniform as we requested. Whenever we receive a clearance via ACARS or CPDLC, we print it out. It’s nice to have a hard copy to reference. The printer uses a thermal print head and rolls of heat sensitive paper. It’s easy to use and looks like a paper tower dispenser! No Radar? How Will Air Traffic Control “See” Us? There’s no radar over the ocean, but oceanic controllers must still make sure all the aircraft are safely separated by distance and altitude. Since they can’t “see” the aircraft, controllers rely on pilots to report their position at regular intervals. A position report provides an aircraft’s location, speed, and altitude so the controller can build a 3D picture of all the traffic. In the old days, pilots reported their position by HF radio every 10° longitude. Now it’s digital (and much easier). As we get closer to PORTI, our oceanic entry point, the flight 105 crew will do an ADS/CPDLC logon to Gander Center. ADS (Automatic Dependent Surveillance) is the system that makes our position reports for us. It allows controllers to request and receive digital reports from the aircraft’s navigation system without bothering the crew. CPDLC stands for Controller Pilot Data Link Communications. It allows pilots and controllers to send requests and clearances back and forth via text. Aviation text messaging without the LOLz & 🙂 . ADS and CPDLC can send data over SatCom (satellite), VHF, and HF radio so they work great over the ocean. As we approach PORTI, our track entry point, we need to logon to Gander’s CPDLC and ADS systems. A few seconds later, an “ATC COMM ESTABLISHED” message appears. This means that our computer is talking to the air traffic control computer. It’s easier than posting a Facebook status! Connecting to CPDLC and ADS is easy. Both systems use the same logon. Fancy digital communication is awesome, but we still need a backup in case the technology fails (that could never happen, right?). Aircraft VHF radios have a very short range, so they are of little use over the ocean. For backup communications, we use old-school HF (high frequency) radios. HF has been used in aviation since the 1920s. It’s reliable and the signals can easily reach across the ocean. The downside is that transmissions are sometimes difficult to hear. It’s like listening to a distant AM radio station at night; lots of static. Facilities with a call sign suffix of “Center” (Gander Center), usually transmit on VHF radios. The pilots talk directly to the air traffic controllers. Facilities with a call sign suffix of “Radio” (like Gander Radio) are typically HF radio services staffed by professional operators. The operators relay information between air traffic controllers and pilots. After saying hello to Gander Radio, we’ll need to monitor their HF frequency in case the operator needs to talk to us. Listening to HF static for hours is miserable. Fortunately, we can use a system that was introduced in 1956 called SelCal (Selective-Calling) to monitor the radio for us. Each aircraft with HF has its own SelCal code assigned to it. The codes are two pairs of letters (like CG-MS). Each letter corresponds to an audio tone frequency. When radio operators need to contact an aircraft, they transmit the aircraft’s SelCal tones (they sound like telephone touch-tones). The tones trigger a chime in the cockpit to alert the crew they are needed on the frequency. AeroSavvy 105, Gander, good morning, go ahead. Gander Radio, AeroSavvy 105, SelCal Charlie Golf – Mike Sierra, Shanwick next, over. Gander, AeroSavvy 105, SelCal OK, over. It’s been a busy few hours, but AeroSavvy 105 is now headed out to sea. Gander Center will use ADS to periodically check our position to assure adequate spacing with other traffic on the track. On a typical flight, we won’t need to talk to anyone again until we approach 30 west longitude. At 30 West, we’ll switch over to Shanwick Oceanic Control, which raises the question: Where the heck is Shanwick? Don’t bother checking a map of Ireland or Scotland; you won’t find it. The east Atlantic region that AeroSavvy 105 will overfly is called the Shanwick Oceanic Control Area. Administration of the area is a joint venture that began in 1966: HF communications are based in Shannon, Ireland, and the air traffic controllers are located in Prestwick, Scotland. The city names were combined to create Shanwick. Just before reaching 30 West, the AeroSavvy 105 flight crew finishes breakfast, turns up the HF radio volume, and contacts Shanwick Radio on the HF frequency provided by Gander a few hours earlier. The radio call is similar to the previous one, except the operator won’t have a Canadian accent. After another SelCal check, the crew will have an hour of peace and quiet before things get busy approaching London. Our CPDLC and ADS will automatically log off Gander’s system and logon to Shanwick like magic! Pilots sometimes refer to 30 west longitude as the “Molson/Guinness Line” (beer aficionados will understand)! If you’re crossing the Atlantic (as a passenger), celebrate the halfway point with a mug of suds. Cheers! The final (and easiest) part of flying a North Atlantic Track is leaving it! As our flight approaches LIMRI, we’ll contact Shannon Control on VHF. A few minutes before reaching LIMRI and XETBO, our oceanic exit points, AeroSavvy 105 will receive a CPDLC message like the one below. At 0520z (about the time we are over LIMRI) the crew contacts Shannon Control on VHF to receive a warm welcome, a new transponder code, and any updates to the route into London. This completes the oceanic portion of AeroSavvy 105. We made it across the pond! Time to contact Shannon Control as we enter domestic airspace! A westbound random route clearance issued while eastbound tracks are active. Q. What if a flight needs to go the opposite direction of the track system? A. If a flight can’t utilize the tracks, it can fly a “Random Route.” Random routes are carefully planned by dispatchers or pilots and must be approved by air traffic control. The routes are required to stay away from the NATs (or fly under them) to avoid interfering with traffic. Random route clearances are issued the same way as track clearances. Cargo flights often fly across the Atlantic at times when the tracks are flowing in the opposite direction, so they fly random routes. Q. Just how busy are the NATs? AeroSavvy knows a lot about flying, but not everything! I’d like to thank three fellow professional aviators (and Twitter celebs) for helping me improve this article. If you’re on Twitter, be sure to follow them! For those types of routes, there are designated published airways. The routes don’t change daily like over the North Atlantic. CPDLC and ADS digital communication is spreading rapidly over many countries. Hi. The “Molson/Guinness Line” leaves me wondering if many aircrew still think “Shanwick Control” is based in Ireland. The radio operators are based just to the north of Shannon but the ATC service is provided by the Scottish Centre at Prestwick. – Hence the amalgamation of the 2 names. I spent 30 years controlling the Notth Atlantic and running visits for aircrew and operational personnel. Very interesting and informative post, Ken. Keep them coming! Well written article for the aviation enthusiast, aviation professional and general public alike. As a former flight dispatcher who dispatched B767s over the North Atlantic and a current manager in the aviation services industry I found your article to be very informative and full of great information. Thank you for sharing. I really appreciate your comments, especially from a dispatcher! I’m glad you enjoyed the article. Thanks Ken, great info as always! Always a great read while slurping the first cup of joe for the day with fellow airport bums.Keep it up and thanks. I’m flattered that my article was your “first cup of joe” reading! Thanks for the nice comments. Really interesting! I have always been curious about the routing over the north Atlantic. Thank you very much for an incredible website. You are appreciated!! I really appreciate your nice comments! Thanks for reading! Wow,,,what a nice explination about NATs…As a airlines pilot, it is a really well understandable & easy one… Thanks. ..
I’m glad you enjoyed it! Thank you for reading. Personally I prefer the music in the last one! Ken are you flying across the North Atlantic now? The first video you linked is already in my article (at the bottom in the Q&A section) 🙂 . The second one is excellent as well. NATS always puts out great stuff! Their Santa tracking videos are the best. I usually fly to Asia, but I try to fly a few North Atlantic trips every year keep current. I would like to know what routes are followed from europe to south america and viceversa. I know that routes go close to north africa and fron there the transatlantic route starts, but how do they know what route? Same logic as NATs? There are several standard, published airways connecting South America and Europe. These routes are not created daily like the NATS. Thanks for reading! So is there anything similar when flying across the Pacific? The Pacific is even larger than the Atlantic, and I believe the Japan-California routes would be very busy as well. The North Pacific has regular, published airways to handle the traffic flying between North America and Japan, Korea, northern China. To fly from North America to Southeast Asia, there are daily published tracks similar to the Atlantic tracks. There are also daily tracks published for flights between Australia and the Middle East & Southeast Asia. What a nice article !!! You’ve sure got an excellent pair of hands for the pen !!! .. am sure your hands are even better for control yokes. That apart, I’d like to add a point about planning too !!! .. A while ago, I’ve done a mistake during planning a flight. Planned the bird for a random route above the track for vantage of higher flight level, (but exactly over the track for taking advantage of the winds). Nothing wrong in that. Only thing is I’ve planned it with a step level due to weight/fuel restrictions, with the step happening AFTER the track entry point !!!! The sky fell on me with the crew not getting clearance from Euro part and last minute fire fighting from my colleagues to set things right !!! May be this will help some one !!! That’s a good point. When we are issued an oceanic clearance, the clearance is for a specific speed and altitude. We can always request a change while enroute, but we may not get it. You might consider an article on North American east and west and north feeder routes that join “feet wet” Atlantic routes or Polar routes. What happens when you get emergency in the middle of ocean? Is that the reason most of the flights from canada to europe fly via greenland? Airplanes fly the routes they do over the Atlantic because they are the fastest and most efficient. I just stumbled on this fascinating article. I fly often between EWR/JFK and Europe/Near East, so you answered many questions. I still enjoy sitting by the window and seeing the expanse of Nova Scotia and Newfoundland unfold beneath my flight. I’m glad you enjoyed the article. Thanks for reading and safe travels! Glad the overview helped. Good luck with your interview! If you do a Google image search for North Atlantic Plotting Chart, you should be able to find some chart samples with Oceanic Entry and Exit points. That should get you started! Ken, you might help clarify a little mystery for me. I photograph airliners flying overhead in my town of Bathurst, New Brunswick, Canada, with a high powered zoom camera. What confounds me is that on certain days, there will be lot of air trafic in my vicinity, but other days, these same flights will be about 100 lateral kilometers to the north or south of my position. I’m wondering if there’s a way for me to determine ahead of time if the trafic will be overhead or out of my field of view. The change in traffic patterns is due to winds over the north Atlantic. The tracks flown change twice a day so airlines can fly optimum routes based on winds. Flights between North America and Europe often fly right over your house! 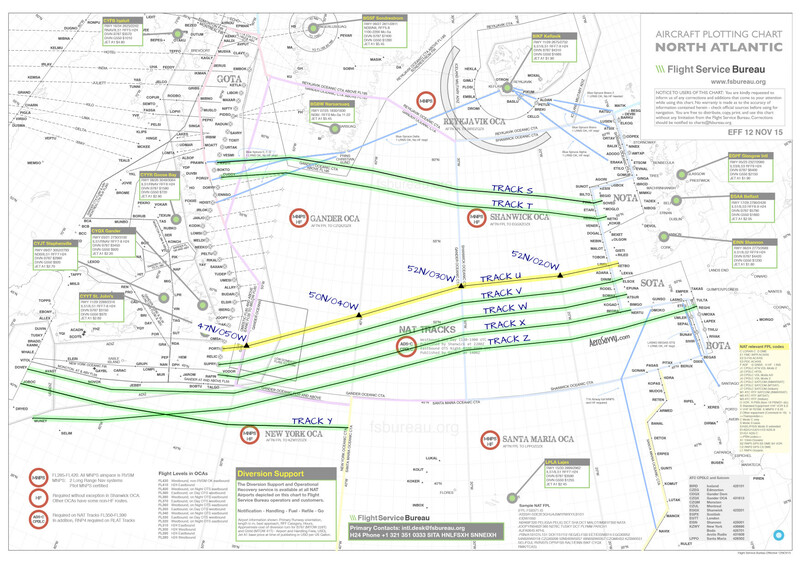 At the end of the article there’s a link for the FAA’s North Atlantic Track NOTAM. The NOTAM is updated twice a day and will give you the Lat/Lon coordinates of each track. Plot them on a map and you’ll know exactly where the traffic will be. I believe FlightRadar24 and similar apps will display the current tracks for you.